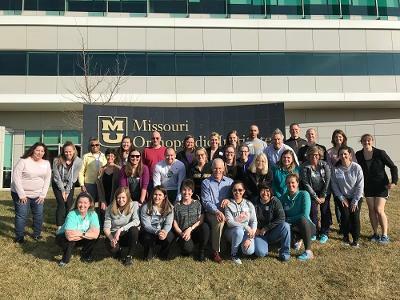 Mizzou Therapy Services located at the Missouri Orthopaedic Institute hosted it's first PRI course, Postural Respiration, this past weekend in a beautiful state-of-the-art facility. What made this weekend significant was that nearly two thirds of the attendees were from Mizzou Therapy Services or new to PRI. This holds the promise of a great opportunity for these therapists to collaborate, practice and potentially master the manual and non-manual PRI techniques taught this weekend. This is the first time this instructor has taught a course with so many participants from the same facility and the energy and enthusiasm from these talented therapists was inspirational! Since most of the class was new to PRI and attending their first course, PRI principles were broken down in detail to provide a solid foundation to a brand new paradigm. Many of the therapists immediately saw the value of Postural Respiration with working with their COPD patients, athletes from the University of Missouri as well as geriatric populations. Postural Respiration has been updated and revised just this year and Posterior Mediastinum could be another name for this course. Patterns, position and posture of the diaphragm affecting every vital system in the body were defined and explored this weekend. Columbia, MO is a great college town and has tradition at their sports games from their fans. On one side of a group of fans they will shout " M-I-Z" followed by the other group answering "Z-O-U!" for MIZZOU! This weekend the therapists at Mizzou Therapy Services have a new chant which is "M-I-Z" ---"Z-O-A!" for the new awareness of "Zone of Apposition" as described in Postural Respiration! Many thanks to Joe Pope, PT, PRC for driving in from Eldon, MO to assist. His expertise and skill at describing and expanding on PRI principles and his lab assistance was invaluable. Joe is thoughtful and articulate with his responses and patience. Thank you to all of the staff at MTS including Lindsey, Laura, Mackinzie, Barbie, Katie and all others that helped to organize and clean up at the end of the day. Your energy and assistance with providing such a great facility was much appreciated.